If you are reading this, then you might be thinking of getting a loan or have already taken one. Loans are usually taken under two circumstances. Either you have a financial goal to meet like buying a house or car, opening a business, education for your child or when you have a sudden financial emergency like a medical exigency, a sudden trip etc. However, taking a loan can be tricky. 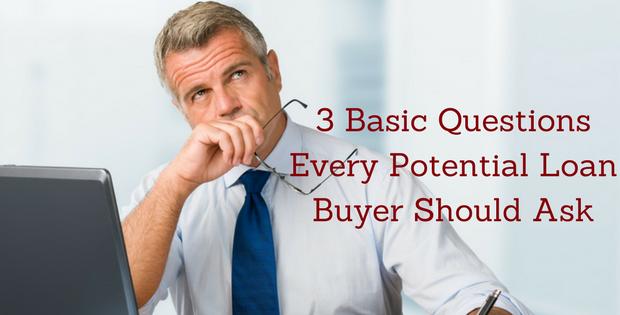 There are multiple factors you need to consider and pay attention to. Any misstep can result in big financial implications. So, before you take a loan, we can you to ask these three basic questions, which should enable you to take a right and informed decision and hold you in good stead in the future. Question 1 – Do I really need a loan? The most important thing to remember – Never take a loan to splurge or buy something you do not need. Take a loan only to meet an important financial need or goal. Taking a loan, for example, to throw a lavish party is not wise. But to take a loan to renovate your home or expanding your business – things that are an investment for the future – can be beneficial. If the amount is small, then you can look for other available options to finance the requirement like your existing savings, borrowing money friends or family, etc. If these do not serve the purpose and you still need to take a loan, then ask yourself if you can afford to pay back the money with interest and that too on time. Before applying for a loan, be completely sure of the amount you want to lend. The amount should not be more than what you actually need. You have to repay everything you lend, with interest. So, any extra amount is actually a loss for you. And never take a loan for the purpose of saving taxes. There are better options available. Before you apply for a loan, make sure you check your eligibility. The first thing that any bank will check, after you apply for the loan, is your credit score. The credit score represents your creditworthiness, it depends on how you well you have dealt with debt. If you have been irregular with your credit card payments, missed paying EMIs on time or applied for multiple loans, your credit score is likely to be low. A low credit score means banks are unlikely to trust you with a loan, and if they do, the loan will come at a high-interest rate. However, if you a good credit score, you have several lenders who will be willing to give you a loan, and you can choose the best and most well-suited option. You can check your credit score for free from online marketplaces like Paisabazaar.com. For those who have a poor credit score, it is recommended that you take steps to improve your credit score first. Repay all outstanding debt, ensure timely payments of EMIs and credit card bills. However, it will take some time before your credit score starts improving. Another possible reason for rejection of your loan application can be not having a credit history. If you have never taken a loan from a financial institution and do not have a credit card, you will be considered a ‘risky’ applicant because the lending banks have no idea how you deal with debt. The best way to build a credit history and a strong credit score is to apply for a credit card and start using it regularly. Do not spend more than 40% of your credit limit regularly and pay your bills on time. Other than credit score, banks check your annual income, age, employer, city etc. before processing your loan application. To ensure, quick processing, check the documents that you will need and keep them ready. Another important deciding factor for the bank is the applicant’s existing debt. To evaluate this, banks check the cash flow to debt ratio of an individual. By cash flow to debt ratio, we mean the ratio of an individual or business’s cash flow to its total debt. One can calculate their cash flow to debt ratio by adding up the recurring monthly debt (credit card, mortgage, loans, etc.) and divide by the income (consider the amount earned before any deductions). With this ratio, a bank estimates a rough amount of time a loan buyer would take to repay its debt. Question 3 – What are my available options from where I can take a loan? Gone are the days when your own bank was the only “shop” for all your loan needs and it was difficult to navigate the maze of various Loan types and lenders. With Digital India, customers are going online to buy everything, including loans. To select the best loan option, it is critical you compare all available options on key parameters before making the final decision on your lender and loan. Today, one can look for the best loan option from various banks and financial institutions, right at the comfort of one’s home (or office). Thanks to online finance marketplaces like Paisabazaar.com, one can take the right decision by comparing the rate of interest, the list of required documents, processing fees and other costs involved, offered by various banks. All loan options and their features can be seen by the applicant on a single screen, making the decision easy and time-saving. Also, with features like instant approval and largely paperless processes, the loan application and disbursal time has reduced drastically. There is no need to visit a bank branch. One of the biggest mistakes that any potential loan buyer can make is taking a hasty decision without doing thorough research. While applying for a loan and its disbursal has become easy and quick, you should take your time exploring the various lenders and loan products available. Once you have decided that, the rest of it is simple. 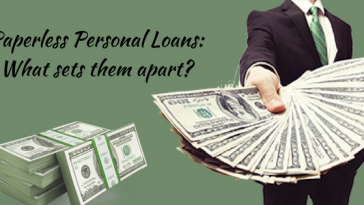 Next article Paperless Personal Loans: What sets them apart?